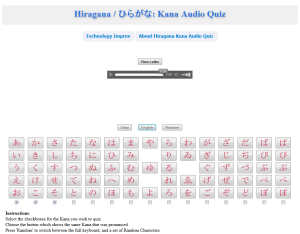 In the first part of this project blog, I set out the goal of creating an Audio based webpage for learning the Hiragana Japanese alphabet. 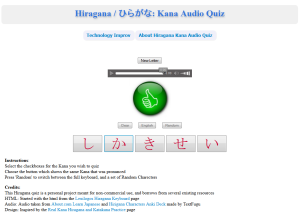 While there are several typing based reinforcement quizzes online, the options for audio based call and response quizzes are fairly limited. 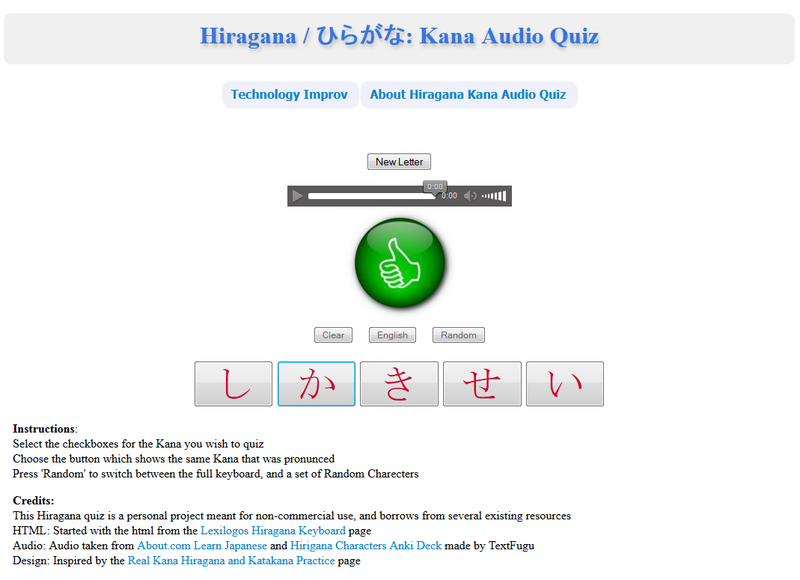 After doing some research however, we saw that several of these writing based quizzes have some great design ideas that could carry over well to an audio version. Learning to read and speak a new language is always an arduous task, especially when you lack the opportunity to totally immerse yourself in that language. Fortunately, there is an increasing availability of good sources online that are freely available. The challenge then becomes finding the appropriate material to advanced your current level of fluency. Online flash card quiz's that drill you on foreign alphabets or vocabulary are particularly helpful during the introductory memorization phase. However, the majority of them I've found recently rely on typing or selecting the English equivalent of the word you are trying to learn. There are only a few websites that give you an audio cue that you then need to directly associate with the proper symbols; thus cutting out the 'first language' middle man. 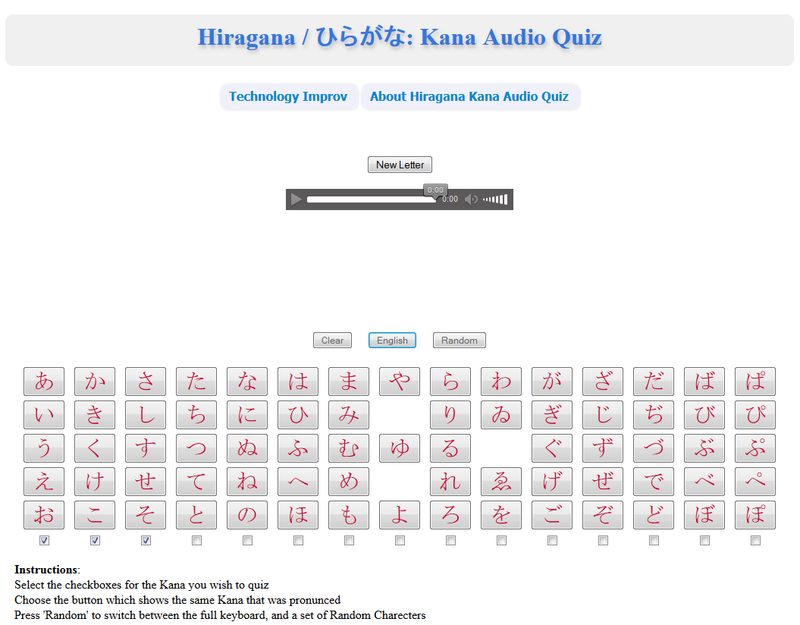 So for my next project I set out to create an audio based quiz system for learning a foreign alphabet. In this specific case, I have taken an interest in trying to teach myself Japanese. The first step involves framing the problem, and looking at some of the existing works on the web that are similar to this. In part two, I'll start building the functionality and applying design concepts to flush out both the interface of the web page and the targeted learning experience. HTML5, What Have You Done Lately? HTML5 is showing up a lot recently in tech articles and discussions. I'll take a very brief look at what it is, highlight some of the recent tech demo's showing off what it is capable of, and also touching upon some of the criticism that has been thrown around. If you haven't heard of the Epic Citadel or BrowserQuest demos and are interested in web development, it is worth a look.